NO GOOD for modern websites. Simple to understand pricing for busy people. For a complete understanding of what features are available please see the full list. We also have a fully functional free version with basic functionality. Learn more about it. Price options are billed yearly and auto renewed annually. You may cancel your subscription at any time. as your User Registration Plugin for WordPress. Following registration, users receive a notification to confirm their email address - helps fight spam. You decide who is a user on your website. Get notified via email or approve multiple users at once from the WordPress UI. Eliminate weak passwords and improve security by setting a minimum password length and enforcing a certain password strength. They also appear in the backend of WordPress. Available extra fields are: Headings, input, input-hidden, checkbox, agree to terms checkbox, radio, select, select multiple, select CPT, select2, country select, timezone select, user role select, datepicker, textarea, reCAPTCHA, invisible reCAPTCHA, generalist upload, avatar upload, WYSIWYG, map, HTML, phone, number, time picker, color picker, custom validation field, currency select. Conditional Fields are an easy way to show or hide fields based on user selections. Using conditional logic you can implement dynamic front-end registration forms for your users. Rearrange and mix both default and extra user fields the way you want. Restrict individual posts and pages based on the user role, logged in logged out status. Restrict for WooCommerce products and bbPress forums. Really simple to use role editor with the possibility to create, edit, delete and duplicate user roles as well as add and remove capabilities. The Repeater Field Module makes it really easy to add repeater front-end fields or groups of fields to your user profile. Integration with both the Email Customizer and User Listing modules, makes creating advanced user profiles possible. Set up multiple registration forms with different fields for certain user roles. Helps capture different information from different types of users. Allow different user roles to edit their specific information. Set up multiple edit-profile forms with different fields for certain user roles. - "search" tags for adding a search form on the All User Listing Template. Support that gets things solved! Time and time again our customers tell us that they love our plugins, but what they never expected was the kind of support that we offer. This isn't by chance. We push ourselves to give 100% on every support request we receive. These addons extend Profile Builder and are available with all versions. Gives you extra settings for Profile Builder. Allows your users to login without a password. It’s as simple as installing it and adding a shortcode in a page or widget. With the help of this add-on you will be able to export all Profile Builder Settings data to a .json. You can then use this file as a back-up or you can import this data on another instance of Profile Builder. This add-on extends the functionality of Profile Builder by allowing you to add custom css classes for fields. Using this addon you can limit the maximum number of characters a user can type in a field added and managed with Profile Builder. Extends the functionality of Profile Builder by allowing you to set multiple admin e-mail addresses that will receive e-mail notifications sent by Profile Builder. This add-on extends the functionality of our plugin and let us easily edit all Profile Builder labels. Extends the functionality of our plugin by replacing Labels with Placeholders in Profile Builder forms. Create private pages for your website users that only an administrator can edit. The Email Confirmation Field add-on is meant to check if the email address entered matches the first one, making sure a user submits a valid and correct email address. This add-on allows you to create select fields with search and filter functionality. All of this in a good looking, responsive select box. This add-on plugin adds a GDPR Communication preferences field to Profile Builder. These addons extend your WordPress Membership Plugin and are available with the PRO and Hobbyist version only. Easily configure and enable social login on your website. Users can login with social platforms like Facebook, Google+ or Twitter. Syncs Profile Builder with WooCommerce, allowing you to manage the user Shipping and Billing fields from WooCommerce with Profile Builder. Extends the functionality of Profile Builder by adding the possibility of having multi-page registration and edit-profile forms. Easily associate MailChimp list fields with Profile Builder fields and set advanced settings for each list. 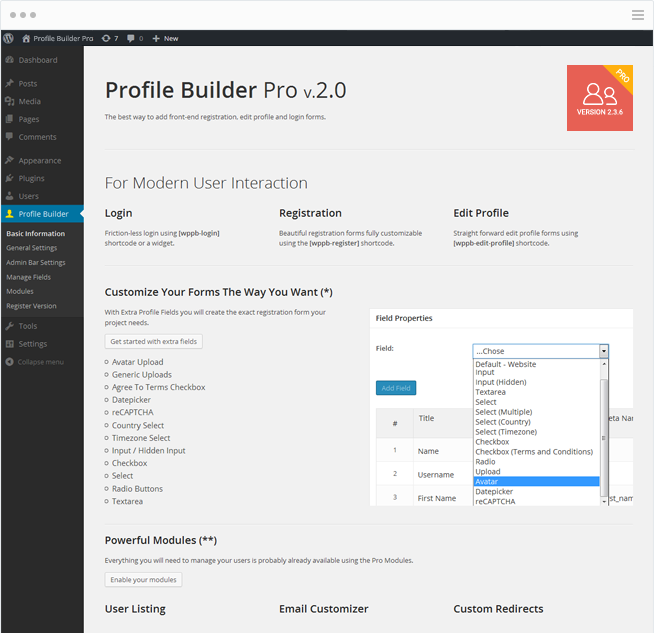 This add-on allows you to integrate Profile Builder with the popular forums plugin, bbPress. This integration add-on allows extending BuddyPress user profiles with Profile Builder user fields. Easily associate Campaign Monitor client list fields with Profile Builder fields. Use Profile Builder Campaign Monitor Widget to add more subscribers to your lists. Add custom menu items like Login/Logout or just Logout button and Login/Register/Edit Profile in iFrame Popup. Allow users to subscribe to your MailPoet lists directly from the Register and Edit Profile forms. Confused? We have a fix for that. Check out our list of Frequently Asked Questions or use this useful pre-sale contact form. Currently all our payments are processed via Credit Card and PayPal and we only accept payments online. If I upgrade from the free version to premium, how should I proceed? When upgrading to a premium version, deactivate the free version before installing the Pro or Hobbyist version. This way all your settings will be ported over. If I purchase a Hobbyist license, can I upgrade later? Sure, you just need to visit your account page and you can automatically upgrade for the price difference between licenses. This is valid for the first two months after purchase. To upgrade without losing any settings, deactivate the Hobbyist version, then install and activate the PRO one from the WP backend. After, delete the Hobbyist version. Are the licenses good for a lifetime? No, each license is valid for one calendar year from the date of your purchase. Licence keys automatically renew yearly. For unlimited updates and support you can purchase an Unlimited License. What do I get with my license? Your license grants you access to priority support, documentation resources, product downloads for one calendar year from your purchase date. You'll also continue receiving automatic updates to ensure WordPress compatibility, as well as great new features! Your Licence is valid for one year from the purchase date. An active licence will grant you access to automatic updates, new features and support. Licence keys automatically renew yearly. Yes, your subscription can be cancelled at any time from your account page. You will retain access to plugin updates and support until your licence expires, one year after the purchase date. Your subscription can be cancelled at any time after purchase. By cancelling, your licence will not renew automatically and will expire one year after the purchase date. Once expired you will no longer receive plugin updates, new features nor have access to support. You may renew your license at any time to reactivate your subscription. I just paid for the Premium version of Profile Builder - Profile Plugin for WordPress, but I can't find the serial number to register with. Where is it? The Serial Number needed for registering your version of Profile Builder is listed in Your Account page, along with some other useful information. Yes we do, see our terms and conditions for refund requests. I can't find a question similar to my issue. Where can I find support? Any questions related to Profile Builder - Profile Plugin for WordPress can be asked on the support page.